Please arrive 15 minutes early to our office to complete the needed forms. 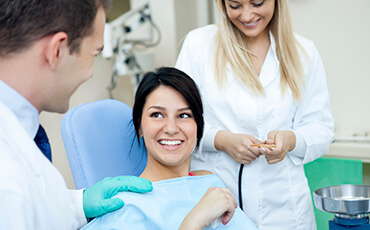 CareCredit helps patients finance the complete cost of their dental care with no money down or upfront costs, no annual fees, no penalties for early payments, and NO interest! There are several plan options available for you and your family (no need to apply more than once), and it only takes a few minutes to fill out the necessary forms. If you’d like to learn more, please visit the CareCredit website. Acceptance will be based on credit approval. Our practice has created an in-office payment plan too! If needed, we allow patients to spread the cost of their dental care over the course of four months with no interest. If you’re unsure which financial option is right for you and your loved ones, don’t hesitate to contact our Jacksonville, FL team for more information. We’re always happy to help. At Dental Center of Jacksonville, we want to help our patients maintain bright, happy smiles they can feel proud of over the years. With our Smile for Life program, you can look forward to receiving free whitening for as long as you maintain a diligent appointment schedule at our practice. Contact us today to learn more and see if you quality!